Rite Aid has a very detailed coupon policy. Rite Aid features a program called Single Check Rebates, commonly referred to as SCR or SCR’s. 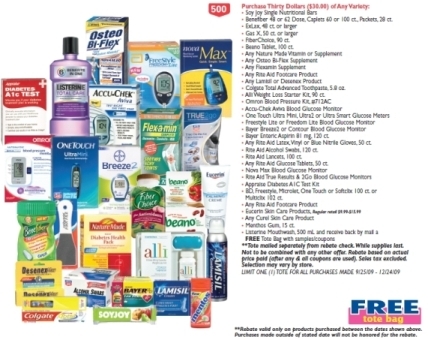 Like traditional rebates, Rite Aid has a rebate for each individual item. Instead of sending separate checks for $1.00, $2.00 etc, the Single Check Rebate program is designed to allow you to shop at Rite Aid during a predefined cycle and get one single check for the entire amount back. There are no UPCs to cut, shoppers card or rebate forms to keep track of. You need to save your receipt from your qualified purchases. You will join the SCR program online and enter your receipts each month. Rite Aid issues a SCR book with each offer in it for that cycle. This book will list dates that the rebate is valid. Note: Rebates are not necessarily valid during the entire rebate cycle. Most rebates are only available for one week. You must check the rebate dates. There are rebate offers that are for multiple product purchases in the rebate cycle. These offers will list dates that the offer is valid, as in the example from purchases 09/27/09 – 12/26/09. You can also view the rebates available. Each rebate will have a rebate #, valid date and the amount of the rebate. It will also include a description and the rebate limit. Once you have made your purchase you will need to keep your receipt. 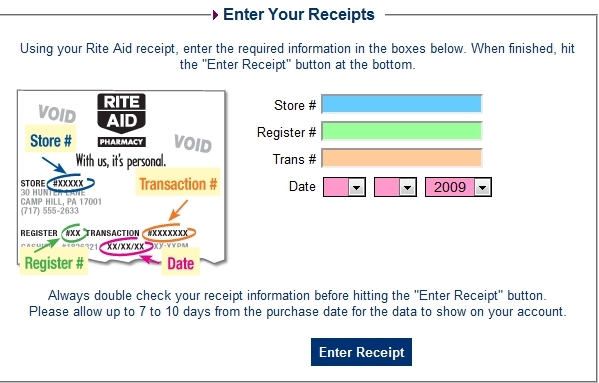 You will then enter your receipt into the computer system. 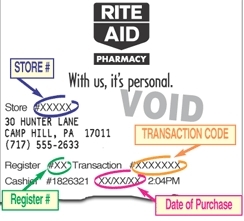 When you enter a receipt, the status of the receipt is “Waiting for Purchase Information to Confirm Your Rebate”, it means that the receipt information you entered has not yet downloaded into Rite Aid’s system. If you entered your receipt on the same day that you made the purchase please allow up to 2 to 5 business days from the purchase date for the data to show on your account. If you have waited more than 2 to 5 business days from your purchase date and the information is not showing on your account, please review the following information carefully on your account. If the rebate program submission has not passed, reenter the receipt. If the rebate program submission or sign up date has already passed, resubmit your receipt information to Special Services for manual processing by fax at 800-457-2243. At the end of the period, you can request your check once all the receipts are entered. You will receive a check in about 2-3 weeks after you submit your request. If the store is out of stock, you can still participate in the SCR program. If you purchased the item on raincheck within the valid rebate dates then the rebate item will show on your account. • If you purchased the item on raincheck outside the valid rebate dates then you will need to resubmit your receipt information to Special Services for manual processing. Valid rebate date refers to the date the rebate item should have been purchased such as the entire program month or a limited time only rebate. If you have purchased the rebate item on raincheck outside of the specific dates on the website or in the directory of the rebate program then you will have to resubmit your receipt information for manual processing. 1) You can print a shopping list on the Rite Aid site. This is helpful to remind you which items you need to purchase. In addition, to monthly rebates, there are also rebates that run outside of this period. In addition to cash rebates, there are also special gifts and gift card rebates. Many times these programs will run for multiple months or outside of the rebate periods. 2) When shopping, you may use coupons in conjunction with your rebates to maximize your savings. There are frequently free after rebate programs that become profitable when you combine with coupons. 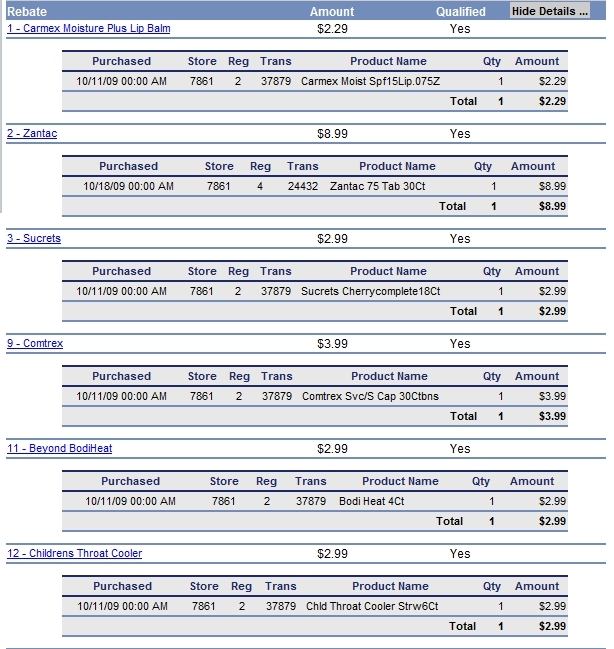 Once you have made your purchases you will be required to enter your receipt information into the online rebate system. Everything you need you will find at the top of your receipt. 3) I suggest that you enter your receipt immediately after you shop. If you decide to enter your receipt the same day you shop, there will be a day or two waiting period before your items show up. DO NOT request your check at this time. Once you request a check, you are no longer qualified for any other SCR during that rebate period. The only exception to this is if there is a rebate that is offered for a multiple month period. This will show up under a separate area of the rebates and you can select it without selecting your monthly check. If you are unsure, it is better to not request the rebate until the end of the period. 4) The check will not be in an envelope when it arrives. They are pink and mailed out of Exton, PA. Be sure to not accidentally throw it away, it does resemble junk mail. 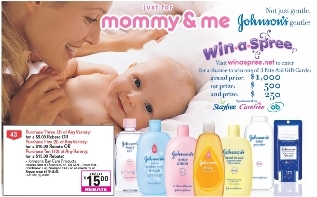 It can be cashed at your bank or used towards other Rite Aid purchases. Some Rite Aids will allow you to get cash back while others will not. So, check with your local Rite Aid to see what their policy is. I put the check amount on a gift card and use it to make purchases for the next month SCRs.